We rarely get fresh methi leaves here. When I get those little leaves, I make this simple & tasty dal curry which taste good with rice & chapathis too. Methi leaves can be used as additional ingredientens in non-veg dishes & veg dishes as well, which brings additional flavour to the dish. 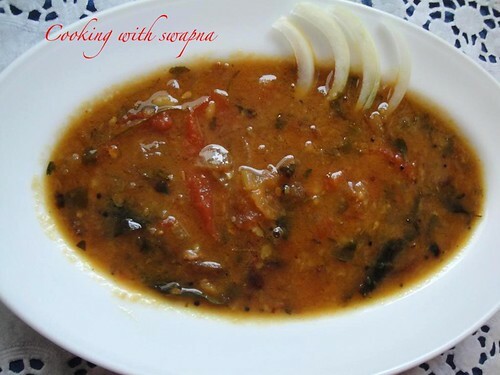 One of my comfort dish & pravin just like this preparation very much. Like to serve this with some yam fry. 1. Combine the dal, 1/4 tsp of turmeric powder & a pinch of hing. Pressure cook them. 2. Heat oil in the kadai, add fenugreek seeds, mustard seeds, urad dal & curry leaves. 3. Once splutter, add finely chopped onion. Saute till tender. 4. 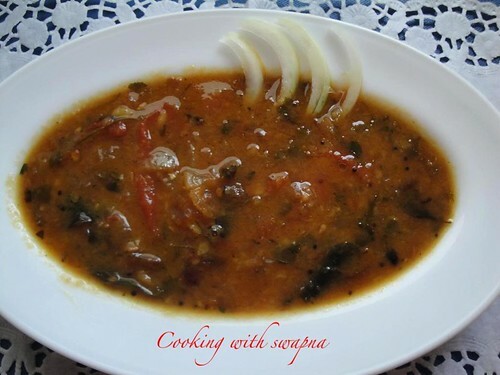 Add finely chopped riped tomato, red chilly powder, salt & finely chopped methi leaves. 5. Finally, add the cooked dal & tamarind extract. Cook for 5 more mins on medium flame. 6. Before switching off the flame, add ghee & corriander leaves. i mix methi in dal too..looks yumm and healthy..